Don’t let ice or snow keep you from driving where you need to go. 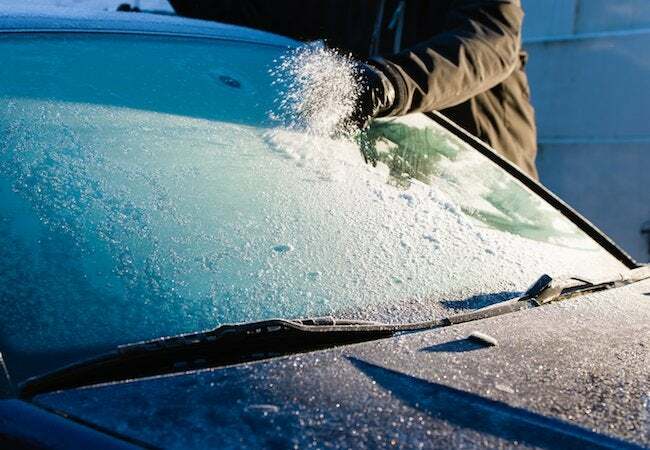 Get a clear windshield and stop refreezing with this simple, price-wise formula. Note: The de-icer spray’s active ingredient is good old rubbing alcohol, found at drugstores for around $2.50 a pint. Also known as isopropyl and isopropanol, it has a freezing point of -128 degrees Fahrenheit, so it won’t refreeze once the windshield has been cleaned. Fill a spray bottle with two parts rubbing alcohol to one part of water. Add ½ teaspoon of liquid dish detergent for every 2 cups. Shake well. Label it as de-icer spray with your marker. Generously spray the mixture onto an iced-over windshield. Spritz a bit on your door locks too, to free them of ice. Wait just a minute or so as it softens the ice, or melts it altogether. Turn your windshield wipers on and with a couple good swishes, your windshield should be de-iced, clean, clear, and ready for some driving! To keep your windshield wiper lines clean and clear of ice, mix isopropyl rubbing alcohol in your windshield wiper fluid at a 50:50 ratio. It’ll keep you ice-free when you need to clean your windshield of sandy, salty snow-splatter spat up from vehicles ahead of you on roadways, and help keep streaks to a minimum.